What’s Happening at the Hall? 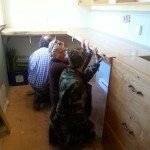 Check out this gorgeous live-edge maple desktop, and these incredible cherry-wood cupboards, and the superb and talented team of volunteers and donors who are making it all happen. 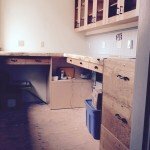 The GAC and kitchen are almost completed. Next steps: kick that rotting foundation into place, and then turn the main room into a dreamy arts-and-culture centre. 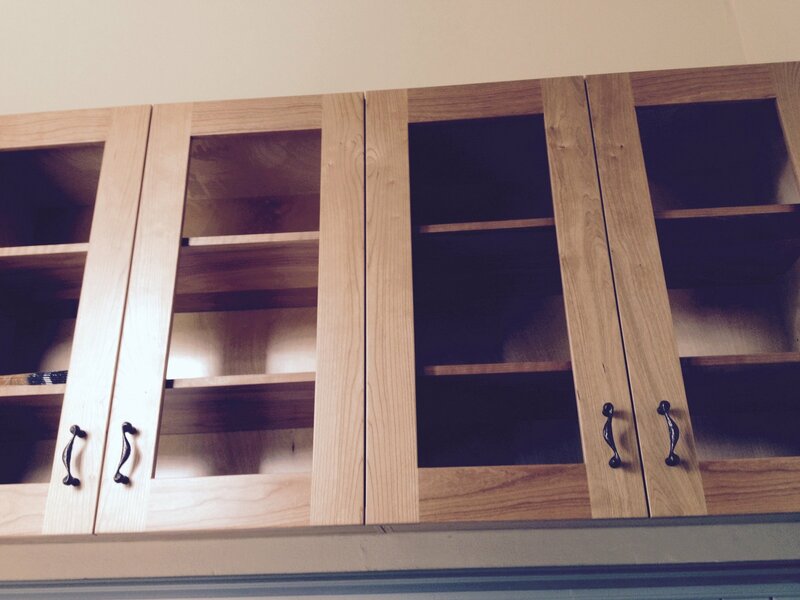 The office cupboards are mostly installed, along with much of the framing for the desk and filing cabinet. The process will pause now while the Isle of the Arts Festival unfolds. 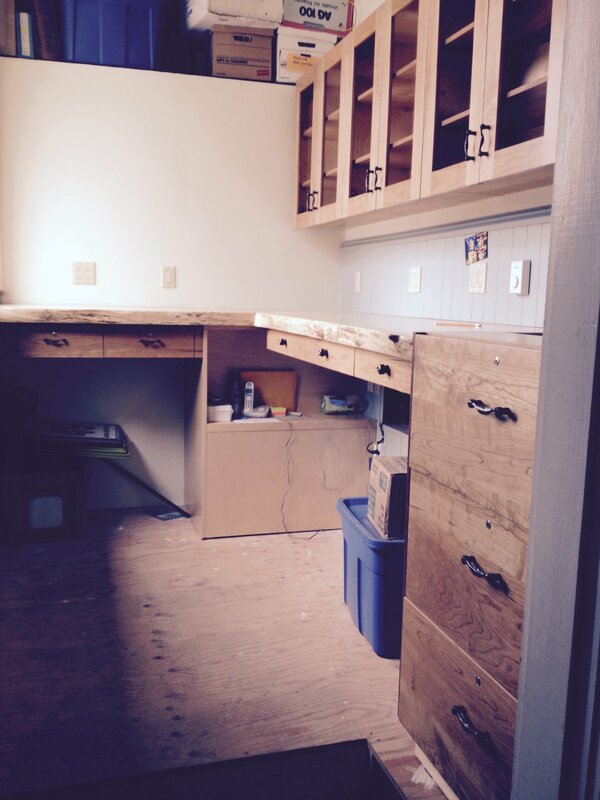 The kitchen is almost complete, the office is underway, and plans are in the works for cleaning up the big room. The electrical system has been upgraded, we’re sorting out the water issues, and we’re compiling a list of our requirements for a new sound and light system. 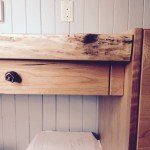 Our friends at GaLTT are working on the Gabriola Women’s Institute Trail, connecting South Rd and North Rd., and a beautiful gate will be woven from the branches and shrubbery. 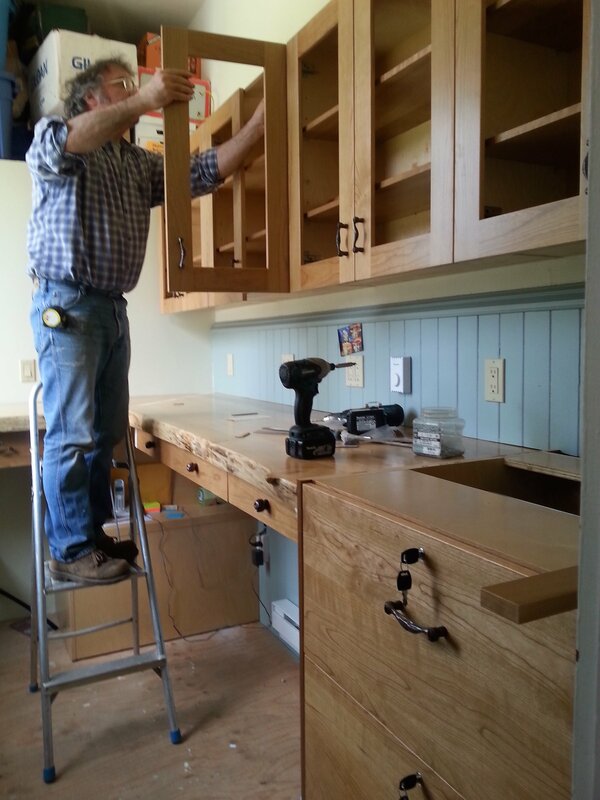 Things are coming along, thanks to the extraordinary contributions of a team of skilled volunteers. Thanks also to Arbutus Building Supplies for their generous contribution. 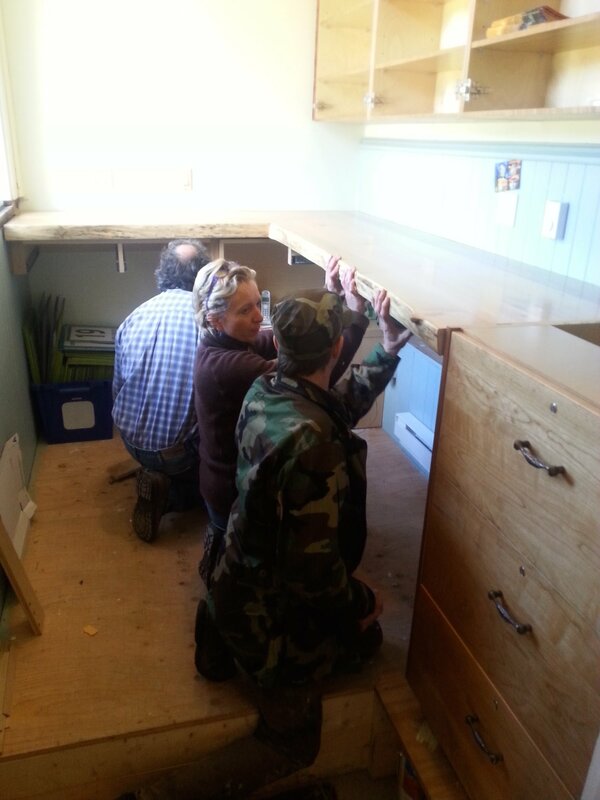 An amazing team of hard-working volunteers have been busy, creating a new Arts Council office space and small kitchen for our guests and renters. 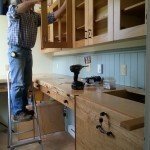 Have a look at what’s been happening, and join us in thanking team leader Jeff Molloy, along with the Guy Mireau, John Peirce, Chris Straw, Renata Gregory, Ode Howard and Konrad Mauch. 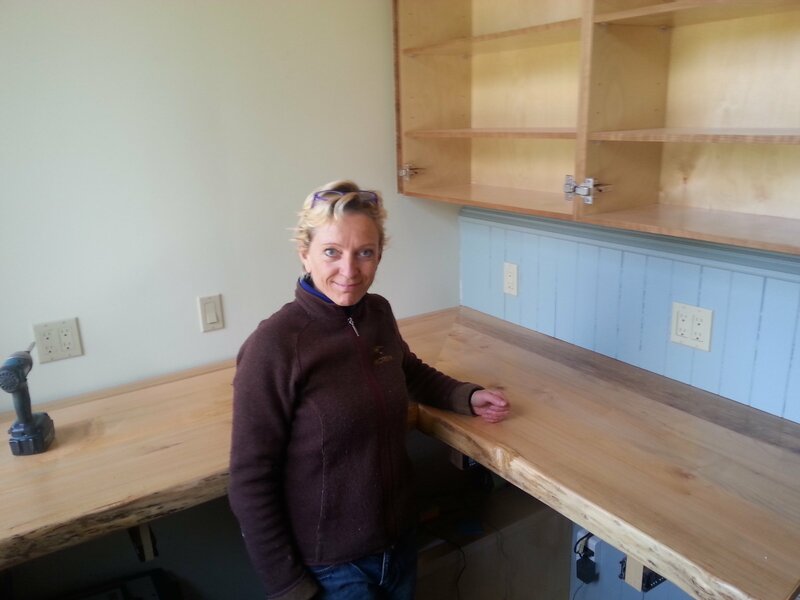 Thanks to Arbutus Building Supplies for incredible generosity, to Ron Ruckman of Atwork Electric for great work on the electrical system, and to Gwen Spinks for the muffin delivery. Thank you also to the regular renters and tenants, for your patience and understanding through this messy process. Keep your eyes on this page for regular updates and images. Coming soon: a new walking trail connecting North Rd and South Rd, from our friends at GaLTT. And a lot more! 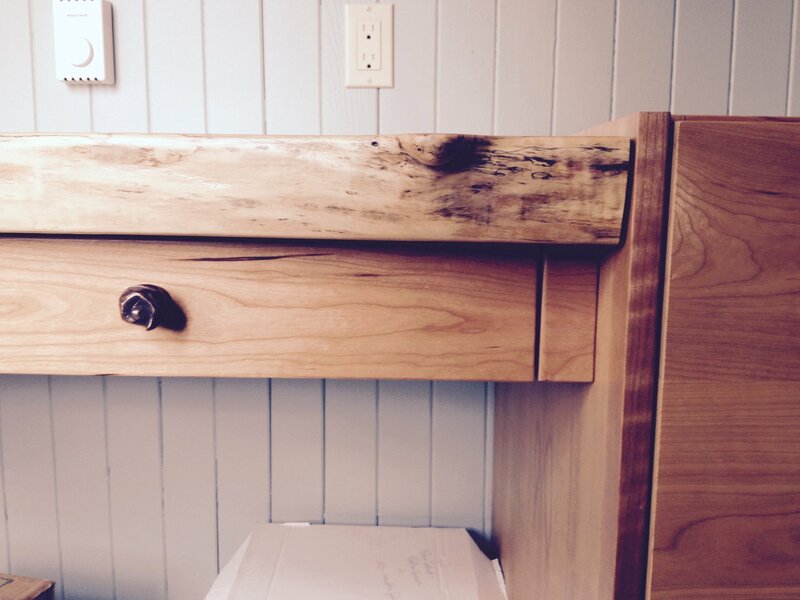 Beautiful live-edge maple desktop and rosebud drawer pulls. Guy, Renata and Jeff — making sure it’s perfect. Love the drawings by Guy Mireau! We’re down to the bones! Raised the floor in the office by 14 inches, now you can see out the windows. Built in dishwasher, toaster oven and fridge. 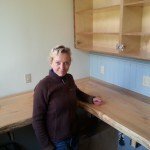 Solid Maple live edge desks and counter tops. 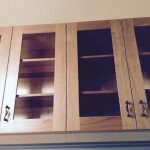 Solid birch cabinets with cherry doors. All the electrical bells and whistles. Main electrical panel upgraded to 200 AMP and relocated, new lighting including under cabinet lighting in the office and in the kitchen. We managed to save the original wainscoting and plan to install a chandelier c/w ornate plaster ring in the office. Also installing a heat pump. Blending old with new. Our motto is “no compromise”. The team effort is fabulous. This is how to save an old building. Thanks everyone. Wow, superb work … just beautiful. Thanks so much for all the love and care you have put into this community arts/culture space. Well done! Looks really great. What a lot of work has been done, thank you to the hard working volunteers. It looks great. Place look great….congratulations to all the hard workers….nice to see the old building renewed not to mention the remarkable creative and arts renewal of fine programs! ← GAC Presents: Medicine by TJ Dawe!